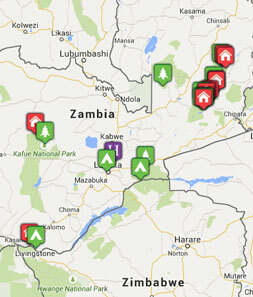 Tribes Overall: "This was our fourth trip to Zambia and it was just as good as the other three." Tribes Service: "As always it was first class." Guides: "Zambian guides receive thorough training and have to pass stringent exams before they can become a guide. Consequently guides all all of a high standard." Social & Environmental Responsibility: "Yes. All of the camps we visited employed people from the local community and at Tafika they were able also to support the local school." A wonderful camp with such jolly and friendly staff. The arrangement of having lunch on your own private decking whilst watching game coming to drink in the river was a memorable experience indeed. And the water from the tap was safe to drink as it came from their own borehole. We were looked after very well. This camp is situated in North Luangwa where the emphasis is on walking. Alex was our guide and host combined and was top class in both respects. His knowledge of the bush and its wildlife,whether large or very small, was outstanding and as a former teacher he was able to explain the interaction in understandable language. Brent our host was a mine of information of life in the bush and clearly it was a great passion of his to live life away from the bustle of civilisation. Three wonderful days in his company. If we were forced to pick a favourite it would be this and that by the tiniest of margins. The style of continental breakfast before the morning game drive followed by lunch at 11-30 suited us and our fellow guests very well. The night time game viewing using infra red lights allowed us to watch game without interrupting their routine in any way. Such nice people who had the unenviable task of entertaining their guests with access to the park cut off because of the rains. We did plenty of walking and saw some pretty good wildlife which we most likely we would not have done from a vehicle. The opportunity to take a microlight flight should not be missed.